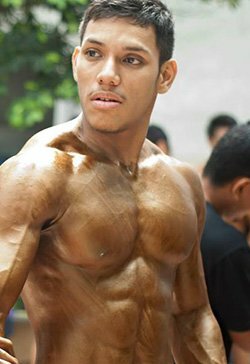 Amateur Bodybuilder Of The Week: Alif Builds Muscle In Malaysia! Alif was a high school rugby star in Malaysia and discovered bodybuilding when he went off to college. Check out the programs he uses to build muscle and burn fat! I was a talented rugby player in high school. After graduation, I went to the Universiti Tenaga Nasional (UNITEN) in Malaysia at age 18. During my first two years of college, I stopped doing sports and became fat. I eventually became tired of my fat body and inactive lifestyle and decided to push myself. I got back into sports and started bodybuilding after I did serious research. It paid off and now I can&apos;t get enough of bodybuilding and competing. My offseason workout and diet plan are the same as my contest regimen. I focus on increasing my weights during every set. "I eventually became tired of my fat body and inactive lifestyle and decided to push myself." This is my pre-contest meal plan. I eat every 2-3 hours. "Always be humble to everyone and keep learning." I challenge myself and never let anyone say that I can&apos;t do something. I can&apos;t wait to go train every day. For me to be successful, my bodybuilding requires hard work and discipline. It&apos;s not just a hobby, it&apos;s a lifestyle. I motivated myself to be a bodybuilder. I want to prove that my body can get leaner and better than yesterday. Mr. Selangor Champ of Champs also inspires me to train hard and be disciplined. When I feel tired or unmotivated I watch bodybuilding motivation videos on YouTube. I also try to focus my mind to become a bodybuilding champion. In the offseason, I try to gain as much mass as possible. I&apos;m currently preparing for Mr. Putrajaya 2014 and hope to become an IFBB pro one day. Always be humble to everyone and keep learning. It&apos;s most important to stay focused on muscle contraction and form. My favorite pros are Flex Lewis and Kai Greene. I always watch their videos on YouTube and like how they perform their workouts. They&apos;re amazing at posing and do a great job showing their full body on stage. I started learning about nutrition on Bodybuilding.com and always read articles on the site to learn cutting-edge information about the sport.